If you are using PHPMyadmin, this might be the easy way out of this problem. 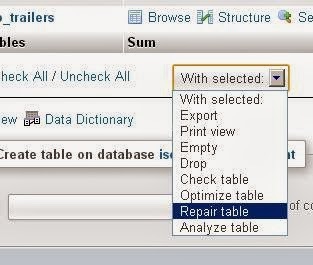 Pick your database and go select/check the table that is causing the trouble. If you have access on the console or SSH, you may want to do it via the said option. This is the same to what the PHPMyadmin does except that the first approach uses a GUI for easier operation. I suggest the first method for less techie users. After doing one of the said solutions above, restart your MySQL server and that should solve your problem. We usually encounter this kind of error - well, not usually. It's more like we ALWAYS encounter this one especially when we're back from the holidays. And it's always THAT one table (which fortunately is not 'THAT' critical when crashed). Power trip daw ung cause. it does happen during power failure but if it is just on one table.. it would be best to investigate further on it..
Reactive lng as of now. If mag`crash ulit, fix.